The beautifully presented fruit on your local grocer’s shelves has been treated with loving care. 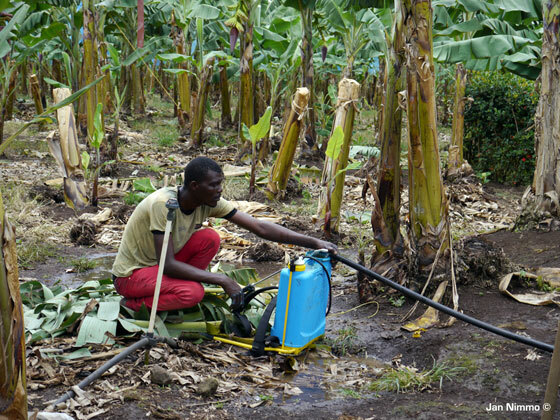 It’s a pity the overworked, pesticide-drenched and impoverished workers in the banana fields are not treated with the same respect. For you, the banana is the ultimate convenience food. It’s full of natural goodness, available year round and comes in its own easy-to-remove entirely natural wrapper. But it is not so good for the workers around the world that tend the banana plants in the field or that wash and process the crop in packhouses. In some regions, particularly in Central and Latin America, murders of members of banana trades unions are not uncommon [see: More murders of Guatemala banana union members]. UK-based Banana Link has witnessed first hand “persistent and increasing violations of labour rights” along the international banana supply chain – and has set out to do something about it. Working with eight Latin American union partners, the group’s Union-to-Union project has played an active role in developing union power and securing safer, healthier, fairer jobs. And the demand exists elsewhere, with work now developing in Ghana and the Ivory Coast. The photographs in this photofile were all taken in Cameroon, another African country where Union-to-Union is providing support. The project has had noteworthy successes: supporting unions in Equador who negotiated a groundbreaking collective agreement with banana multinational Dole; bringing about an increase in the minimum wage and the removal of an anti-union law in Peru’s agricultural industry. In Cameroon, Union-to-Union is working in partnership with the plantation workers’ union FAWU to press for a living wage and improved health and safety standards. This influence is being felt across the supply chain. Banana Link has a prominent role the World Banana Forum, an international initiative bringing together unions, producers, campaign organisations and companies and retailers in a bid to make the industry more sustainable. One of this forum’s key projects involves sharing knowledge on good health and safety and environmental practices. 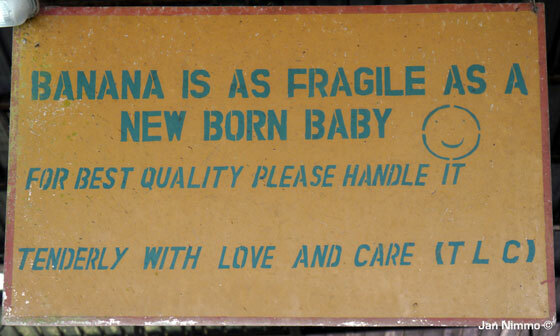 BABY CARE This photo taken in a banana packhouse in Cameroon shows the product is treated with a level of tender loving care not afforded the workers. KID GLOVES? This pregnant woman was still working, despite being full term. Her job required her to toil in tropical heat without access to water and for hours without a break, applying fertiliser by hand. There is no access to safe drinking water on any of the plantations, workers have to bring drinking water for the whole day with them - hundreds of people will share access to a single tap in their community. TOXIC BAGGAGE The blue bags are lined with the highlight toxic nerve poison chlorpyrifos, an organophosphate pesticide. 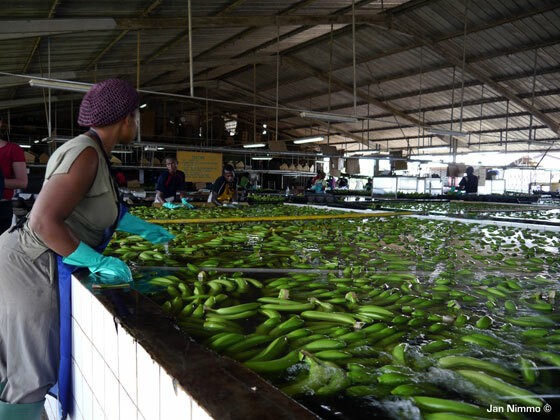 Workers bagging, unloading and unpacking the bananas are not protected from exposure risks including numbness, weight loss, loss of libido, suicidal thoughts, respiratory problems and birth defects. CHEMICAL SOLUTION This worker is required to use toxic agrochemicals without protective clothing. 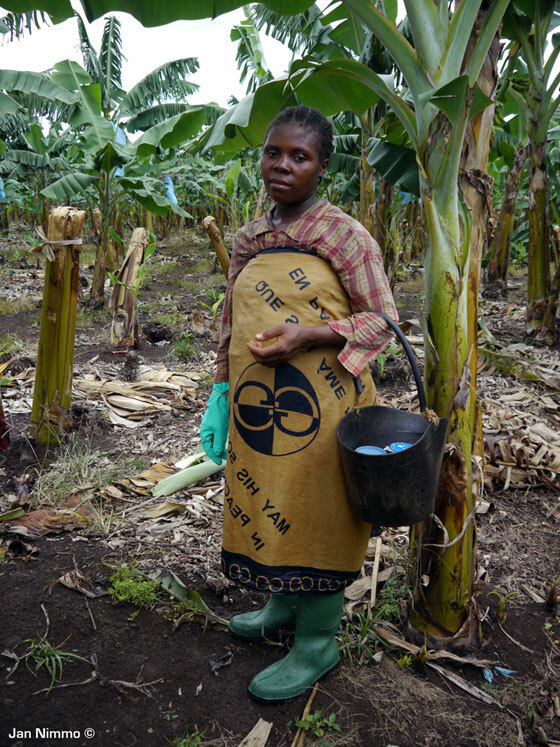 Banana Link’s union partners seek to establish functioning health and safety committees on all of the plantations and to provide safety training for workers and union representatives. 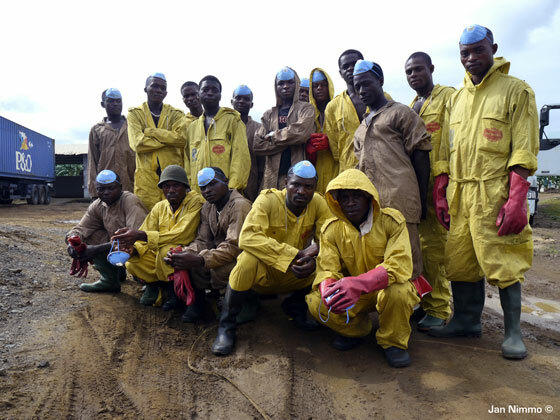 PESTICIDE DELIVERY These workers prepare to unload a batch of the insecticide and nematicide Counter. The neurotoxin can cause tremors, blurred vision, nausea, abdominal cramps, fluid in the lungs, seizures and death. 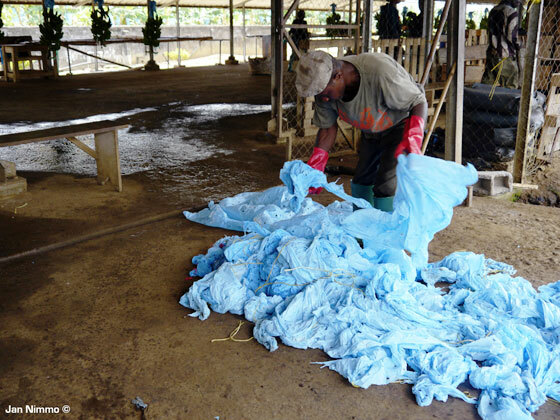 One worker told Banana Link the protective clothing should be thrown away after one use but is washed - by hand, without protection - and reused again. NO PROTECTION This woman was working in the field during overhead spraying, despite the company denying this happens when workers are present. 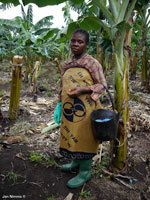 She said she shielded herself under the leaves of the banana plants. Chlorothalonil, the fungicide which is aerially sprayed causes blurred vision, dermatitis, respiratory problems, vomiting, vaginal bleeding, kidney cancer and death. DAILY STRAIN Packhouse workers endure extremely long days - sometimes from 8am until 10 or 11pm. The repetitive nature of the tasks leads to a range of health problems, notably back pains. The murder of union members in Guatemala’s banana industry is continuing. Seven current or former members of the Guatemalan banana workers’ union have been murdered since 2011. The US Labor Education in the Americas Project (USLEAP) reports the most recent casualty, Miguel Angel González Ramírez, a member of the Izabal banana workers’ union, was shot on 5 February 2012 while he was holding his young son. No one has been arrested for murders USLEAP calls “the slow moving massacre of the largest private sector union in Guatemala.” On the day of Ramirez’s murder, the Guatemalan government had lifted its 24-hour security protection for the union’s secretary general. In 2008, under the terms of the Dominican Republic-Central American Free Trade Agreement (DR-CAFTA), US national union federation AFL-CIO and six Guatemalan unions filed a complaint with the US Labor Department outlining the systemic failure of the government of Guatemala to enforce its own labour laws or to take reasonable action to prevent violence against trade unionists. In 2009, the International Trade Union Confederation (ITUC) named Guatemala the second most dangerous country for trade unionists, behind Colombia. 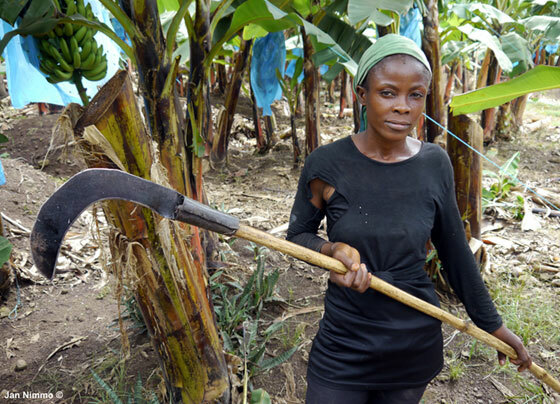 Banana Link’s ‘Union to Union’ initiative to challenge hazards and employment abuses in the banana industry’s supply chains needs your financial support. “While we are working hard to secure funds from other sources, solidarity from rank and file members and union branches at the consumer end of the supply chain is at the heart of this programme,” the group says.